Alzheimer's disease is irreversible and destroys brain cells which can cause thinking ability and memory to deteriorate. It is one of those progressive disease that usually affects memory and several other mental functions. Initially, the affected person may have a little confusion and difficulty in remembering things but after some time he may also forget the most important people in his life. It is also a common cause of dementia, which is in turn is a group of brain disorders that cause loss of social and intellectual skills. Difficulty in performing daily basic tasks such as bathing or dressing etc. WHAT ARE THE CAUSES OF ALZHEIMER'S DISEASE? It is believed that this disorder occurs due to the combined effects of lifestyle, genes and several environmental factors as well. The exact cause is not clear, but it is clear that the disorder affects the brain cells and kills them. It proceeds with excessive brain cell damage. The plaques are the cramps of protein which are called beta amyloid. These clumps are known to damage and destroy the cells of the brain and in turn affect the communication of the cells. The normal functioning of tau protein is essential in order to transport essential nutrients and minerals in the brain. In this disorder, the thread of tau protein twists into abnormal tangles and leads to failure of the transport system and causes death of brain cells. 3. Blood Test - It helps to detect other symptoms similar to those of Alzheimer’s dementia such as a thyroid disorder or Vitamin B-12 deficiency. It results from the progressive loss of brain cells. This degeneration may show variety of ways in brain scans. Increasing age is the greatest known risk factor of Alzheimer’s disease. Alzheimer’s is not a part of normal aging but risk gets increased after the age of 65. The risk of developing Alzheimer's appears higher if it is found in immediate family members such as parent or sibling. Many people with Down's syndrome may have Alzheimer's disease. Women have more chances to develop this disease than men. People with mild cognitive impairment (MCI) have memory problems or other symptoms of cognitive decline that are worse than might be expected for their age. People who have a severe head trauma seem to have a greater risk of Alzheimer's disease. 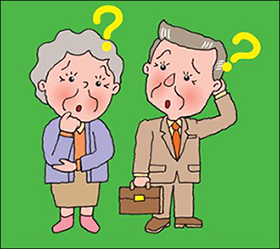 WHAT ARE THE COMPLICATIONS IN ALZHEIMER DISEASE? Inhaling food or liquid into the wind pipe. According to Ayurveda, Alzheimer’s disease is termed smruti nasha. As Alzheimer’s disease is a problem of old age where vata dosha is much aggravated. The vata passes from the majja dhatu to the mano vaha srotas, Thereby causing disorders such as paranoia, memory loss and delusions. Alzheimer’s disease is caused due to imbalance of vata, which is common in old age. According to ayurvedic principles, vata in the tissues of nervous system, especially brain gets imbalanced. This directly leads to problem such as lower level of coordination, unclear thinking, lack of inhibitors and retarded words and actions. Mano vaha srotas or the mind channel that carries thoughts is affected due to the vitiation of vata. This is the reason for delusions and mental disturbances. 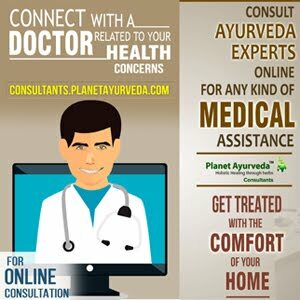 According to Ayurveda, the tensions and stress a person experience in his or her life causes disturbances to vata, the accumulation of which causes severe nervous problems. The Brahmi herb is famous for its magnificent properties. It is beneficial to increase the brain functioning. It has a few astonishing effects which are very beneficial in the treatment of Alzheimer’s disease. It affects both long term and short term memories, therefore, it is used as a brain tonic. It controls anxiety of the nervous system and the ayurvedic herb is used as a tranquilizer. It promotes the relaxed state of mind and nerves, spreading calmness. It helps to manage depression and stress that occurs due to this mental disorder. Dosage- 2 capsules twice daily with plain water after meals. Curcumin is a strong anti-oxidant that reduces the anti-oxidative damage and inflammation as well. It reduces the amyloid accumulation also which is otherwise a primary suspect in this brain disorder. It helps to remove the toxins and supports immunity. It has anti-inflammatory properties which make it a strong herb for various allergies, inflammation and infections. This herb fights against toxins and infections and is rich in anti-biotic properties. It is beneficial for the treatment of Alzheimer’s disease. It is prepared by using the standardized extract of gotukola herb (Indian pennywort). These herbal capsules are effective in treating Alzheimer’s disease. This herb is useful for all kinds of nerve related diseases. It is useful to manage the symptoms associated with Alzheimer’s disease to a great extent. It is beneficial in nerve exhaustion that occurs due to stress and anxiety. Gotukola is rich enough in nutrients and has a brilliant action in enhancing the concentration power and in this way it helps in case of concentration as well. It is prepared by using various herbs such as brahmi (Bacopa monnieri), Vacha (Acorus calamus), shankhpushpi (Convolovulus pluricaulis) and Licorice (Glycerrhiza labral). It is the greatest medicine to manage loss of memory. It supports the brain power and supports healthy functioning of brain. It is useful to manage memory related disorders. Lack of concentration and retention power can also be managed by memory support capsules. This product is effective in managing the Alzheimer’s disease. It helps in recollecting and remembering things. Dosage- 2 capsules twice a day with plain water after meals. Medhya churna is effective for the treatment of Alzheimer’s disease. 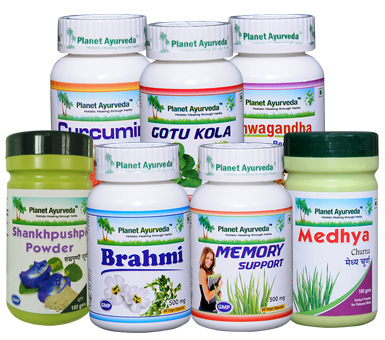 It is prepared by using different herbs such as vacha (Acorus calamus), Ashwagandha (Withania somnifera), Brahmi (Bacopa monnieri) etc. Medhya Churna is useful for improving memory and recalling things easily. It is beneficial in enhancing concentration. This product is an excellent tonic for boosting the mental health. Dosage- 1 pinch/1 gram of powder twice daily. It is extensively used in nervous system disorders. It is described as a nervine tonic, adaptogen and aphrodisiac and it effectively treats stress. It plays a very important role in Alzheimer’s disease as it has an adaptogenic effect. In this herb various steroidal compounds are found such as withanolids which have properties to block the neuronal cell death, fibril formations. It enhances the cognition, memory and recalling capabilities. Dosage- 1-2 capsules twice a day with plain water after meals. It is an effective herbal remedy to treat the Alzheimer’s disease. It is known as a nervine tonic to improve cognition and memory. It contributes in calming the nerves which aids in regulating and releasing the stress hormones adrenaline and cortisol. It increases the dendritic intersection, branching points and dendritic processes. Dosage- 1/2 to 1 teaspoonful twice daily with plain water after the meals.